“My grandma dying is literally the best thing to happen in the history of the world.” Emily (Jamie Saunders) just lost her grandma but in doing so she gained an apartment in New York City. Amongst the many contents of grandma’s apartment is a little soufflé dish known as a ramekin. This Ramekin won’t let her leave the house. Confined to a New York City apartment, Emily slips under the control of a maniacal ramekin with a thirst for blood. It’s time to paint the world red. For an indie film with a $500 dollar budget I’ve never seen anything better. Yes I said a $500 budget. Though confined to an apartment and with only a handful of people in the cast, the limited budget helped keep things original creating something completely unique. I’ve seen multi-million dollar productions that can’t capture my attention, first time filmmaker Cody Clarke does so with a small porcelain baking dish. 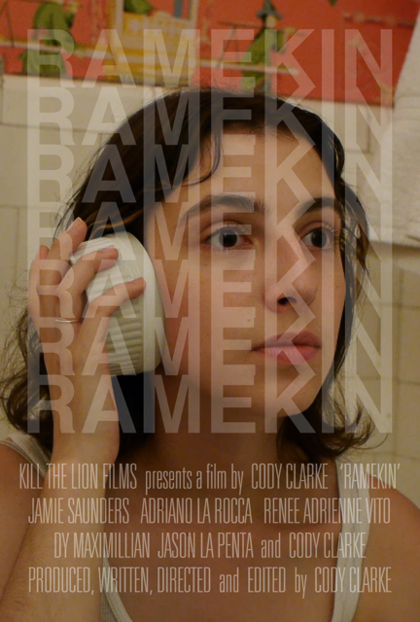 Unlike previous films of killer commodities, Ramekin is a dish best served cold. What I will give away about this gem is a little of its profoundly terrifying dialogue. All said at the end of an innocent actresses endearing smile. I’ve seen so many films with bigger budgets and more to offer than a ramekin dish. This movie is better. I love the simplistic, over enunciated wordplay. I love the ridiculously controlling killer ramekin. I fell in love with Emily and will marry her if the ramekin allows it. Ramekin is held up by its performances and Saunders leads the way in a tiny cast. I am certain Cody Clarke deserves credit for every character perfectly delivering oddly unique roles. Unrealistic, matter-of-a-fact dialogue is happily unlike anything I’ve heard before. “You have red flowing within you and I want to let it out.” This movie deserves a larger audience. I fell in love with it. Catch it at your local Film Festival Now!